It’s set up, ready to go! CMCIG has found a new home for our listserv; it is being hosted on Google Groups (https://groups.google.com/forum/?fromgroups#!forum/alao-cmcig). This is another way for members to connect with each other and post information, ask questions, and for us to send out messages about upcoming events. If you would like to join the CMCIG listserv, please send a request. We will be happy to have you join us. Also, if there are others at your institution who may be interested in joining our listserv, please feel free to share this information. The CCMIG would also like to announce its sponsored program at the 2012 Annual Conference will be “Storytime at the Academic Library.” Jennifer Smith, professor of library services at Northern Kentucky University, describes the establishment and development of a children’s storytime at her library. She’ll provide tips, tools, and reading lists that may help you implement children’s and family programming into your academic library. This past year we were very excited to present our first research and presentation grant to our Distance Learning Visionary. In just a few months, DLIG will begin collecting applications for next year’s visionary, and we need your help. You can nominate yourself or another individual that you think fits the bill of a Distance Learning Visionary. In addition to earning the award title, the chosen recipient will receive a $150 presentation grant for sharing their innovative ideas at the DLIG Spring Workshop (remote participation is permissible). For more details, see the DLIG page on the ALAO website or follow the DLIG blog at http://distancelibrarians.wordpress.com. DLIG is also excited to announce that they are sponsoring a session by our 2012 Distance Learning Visionary, Ken Burhanna, at the upcoming ALAO Annual Conference. Please see the Conference website for more details. The Instruction Interest Group (IIG) will sponsor another exciting session at ALAO Annual. Entitled, “Change Course? Let’s Change Wikipedia Instead – Rethinking Information Literacy,” Instructional Design Librarian Resident Brian Leaf and Head of Teaching and Learning Karen Diaz from The Ohio State University Libraries will discuss information literacy with respect to their extensive Wikipedia Revision Project. In the context of a recent course redesign, these OSU librarians advocate moving beyond the ubiquitous annotated bibliography assignment, using Wikipedia as a framework for evaluation of and contribution to the information landscape. The Instruction Interest Group (IIG) cordially invites ALAO Annual attendees to join us for networking and discussion at our IIG Roundtable. Led by co-chairs Lauren Wahman (University of Cincinnati, Blue Ash College) and Katie Foran-Mulcahy (University of Cincinnati, Clermont College) the roundtable promises to be a lively venue for librarians interested in student learning. Attend this roundtable and learn about IIG and getting involved, plus discuss library instruction with colleagues from around the region. In addition to the roundtable, IIG is also once again sponsoring an information table so conference attendees may learn more about our organization at any time during the conference. 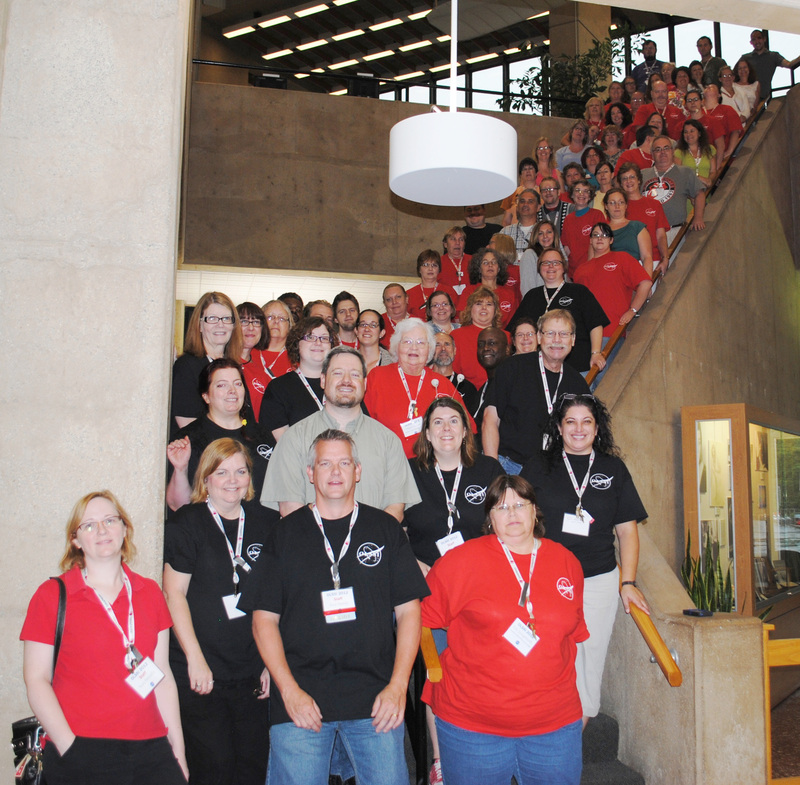 OLSSI, held its eleventh annual conference at Wright State University, July 22 – 24. In a continuing effort to educate and network library support staff, OLSSI partnered with three other Ohio library organizations this year: OCLIS, ALAO, and OLC. OCLIS, the Ohio Council of Library and Information Services, provided a donation that allowed the OLSSI to bring in a speaker from Michigan, and also paid for a scholarship to bring one more first-time person attendee to the conference. ALAO sponsored a class titled “e-Readers: Books of the Future… Today!” It was presented by Sue Polanka, President of the Academic Library Association of Ohio. The OLC presentation was titled “The Future: Libraries Evolving Role in Education, the Community, and the Space They Occupy.” It was presented by Doug Evans, Executive Director of the Ohio Library Council. TEDSIG will be sponsoring the ALAO 2012 conference session: “Bridging the Gap with Boopsie: How a Mobile App Can Help Keep Your Students Connected,” presented by Jennifer Donley and Kathleen Baril, Ohio Northern University and Brent Etzel, Cedarville University. “As mobile technologies become more prevalent, the academic library must adapt its information delivery platforms to its users’ needs. In response, some libraries have begun adopting mobile apps to provide access to information for their patrons via smartphones and tablet computers. Librarians from Ohio Northern University and Cedarville University will discuss their planning, implementation, marketing and evaluation processes that took place when they adopted the Boopsie library app”.